Finally had a very sound sleep that night since the pressure of the marathon race was lifted from my shoulder, now officially my vacation starting here!! First thing first — we would go for a run!! To most people this must sound crazy, running again after a 26.2ml marathon is a “first“?? 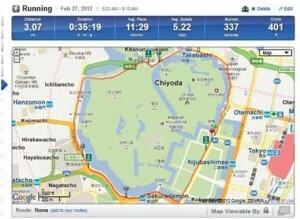 But to us it’s just normal, part of what we do :-p This would be Max’s first run in Tokyo and served as a recovery run for me, and I was sure Max’s legs were twitching really bad from not having had any good runs for days already. 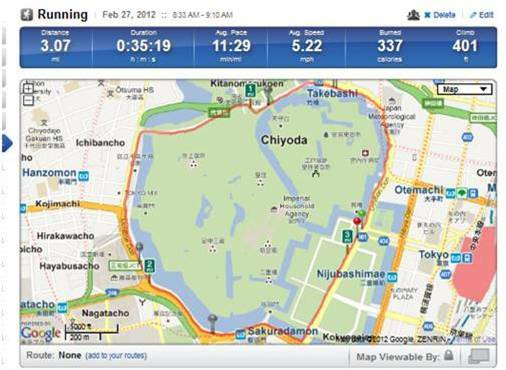 I suggested that we ran around the Imperial Palace, that way he could go as many loops as he like while I figured out how much my body could handle after yesterday’s race, and we wouldn’t have to worry about getting separated due to our pace difference . We took the JR and found us looking quite out of place again in our running attires- beanie, windbreaker, tights..etc. The Imperial Palace was very quiet in the early morning since no tourists had arrived yet, and the moat waters were flickering under the winter sunlight like shiny medallions — can’t believe we owned the whole scenery to ourselves. We figured it would take similar amount of time for me to run one loop and Max two, so we agreed to meet up by the Palace guard post later. The path surrounded the Palace offered a very scenic and nice up and down rolling hills course, and I came across couple runners who all looked very serious about their morning runs. I could feel my legs were a little heavy, but I was in no training mode now and found no reason to push myself fast anyway (((Yeh, the race is over!))) I stopped couple times to appreciate the beautiful surrounding and to take pictures, and finished my one loop recovery run comfortably at 11:15+ pace. Surprised to find Max was there waiting already, and I wondered why he cut his run short and if he was being lazy since we were on vacation. My bad though, he cut his run short because he did not want me waiting around in the cold! That was so nice of him, and totally unexpected! We were cold and almost broke — only 500 yen left, and we found no ATMs nearby to get money exchanged. We figured we still could afford two coffees at least, very luckily, so went to the Starbucks inside Mori Building and had our first coffee in Japan. The menu, setting, signage, music all felt very much like in the U.S., except here we could not have free WiFi access. There was no firm plan where we would go or what we would do on our last day in Tokyo, so we took our time to enjoy our morning coffee and just chitchatted — about going to onsen (温泉), maybe some shopping, and perhaps a Ramen Museum which I learned about from another runner. We decided that we would go back and shower first, then get our hotel booked for our next destination — Kyoto. Originally I had booked a place on Travelocity back in Nov, but later learned that I could get much better deal once we were actually in Japan – local travel agency could get us better deals that website couldn’t. I remember seeing JTB sign not far from our hotel, so we went out and found it on the main street near that love hotel we saw at the first night. The lady at JTB was very resourceful and friendly, and she booked us the hotel that Anita had recommended – New Miyaki Hotel, Kyoto (新・都ホテル京都), which was just right by the Kyoto JR station (京都駅) and reasonably priced. We had the 7-day JR pass which allow us unlimited train rides including the Shinkansen (新幹線), so we took the high speed bullet train from Tokyo to Shin-Yokohama (新横浜), then walked to the Shinyokohama Ramen Museum (新横浜ラーメン博物館). Honestly I did not know what to expect, but being a huge ramen fan I was very intrigued by the fact that such museum actually existed. It’s a very small museum, and looked almost wacky to me but certainly interesting if you like ramen. It featured ramen from nine most famous ramen shops representing different regions: Sapporo, Asahikawa, Tokyo, Yokohama…etc. Each little ramen shop had the ticket vending machine by their small entrance, so you buy the ticket first then hand it to the server just like a regular ramen shop. I was excited to find an unusual ramen style that I have never had it or heard of before – broth that’s thicken by grinded fish powder and it’s spicy. Here is a layout of the ramen museum. One advice if you plan to visit this museum — there are different types of ramen that you can experience here, so you should order the smallest serving size they offer, that way you don’t get stuffed at first stop like we did. After that very yummy but fulfilling ramen, we spent some time browsing the museum which really were not much to look at, but gift shop was fun in a strange way ( this is Japan, don’t forget)! Got to thank Max for spending (wasting) couple hours goofing around with me at this place. We called Anita afterward and asked about where we would meet for dinner that night, and she also suggested we visit the Yokohama Chinatown (横浜中華街) which I had not much desire, but it’s quite popular to tourists and I assumed Max might find it interesting since this was his first trip to Japan (Asia as a matter of fact). We hopped on the JR again and headed toward Kyoto direction for our short trip to Yokohama (横浜), which according to the route directory at the station should be only 4 to 5 stops from Shin-Yokohama. We were on the train for maybe less than twenty minutes, then Max spoke to me in a disbelief tone “I think we are going backward.” “Huh, what do you mean?”, the train was moving fine. Right?! He explained “I think we are going back to where we board the train”. “No way, we did not make a U-turn or anything; let’s see what next stop is!” And as amazing and unbelievable as it possibly be, the train WAS heading toward the Tokyo direction – we were going back to where we were. We started laughing so hard on this crowded train about we just had a quantum leap experience, and we tried to figure out when and how it happened! Even till this day, we still had no clue at all. Since I had no interest in Chinatown to begin with anyway, we decided to return back to Tokyo and I suggested we visit the Tokyo Tower (東京タワー). This was not my first trip to Japan, but it’s the first time for Max, so I hoped he get to see and experience as much as possible in such short period of time. From a brochure that I picked up at the JR station, it described Tokyo Tower as the “lighter and better version of Eiffel Tower” and I found it very amusing since Max is a French. Therefore how could we miss Tokyo Tower, oui? We left Tokyo Tower to meet up with Anita for dinner, this time we were in Ginza (銀座) — an upscale area of Tokyo with high-end department stores, fancy boutiques, restaurants and night clubs. It’s recognized as one of the most luxurious shopping districts in the world. We walked around in the alleys of Ginza and tried to find interesting place to eat. To show “respect” to the marathon finisher – me, I had the honor and opportunity to pick what I wanted to eat. I told Anita that I wanted to try authentic Oden (おでん) dish instead of a big meal, so she took us to a small and cozy Oden place and we choose several little dishes plus couple sake to go with. Max was excited to show her the photos he took today and telling her about our ramen trip. I was just busy looking around this fun little place, and enjoyed my cool and tasty sake! The Oden here had taste of miso which I never had before, and it’s definitely an acquired taste in my opinion. We then went on to find a coffeehouse for some desert since I have always been a fan of Japanese style French pastries. During our scavenger hunt I saw a beautiful and luxury looking building, which turned out and wasn’t surprised at all to be the headquarters of Shiseido. The latte and chestnut cake were both really good to my expectation, and such a comforting way to end our evening. So time to go back and pack again ( I hate packing)! We were to leave Tokyo in the morning and heading to Kyoto;, a little sigh in my heart about missing onsen in Tokyo but truly looked forward to Kyoto – my favorite place in Japan!!! !